This server is equipped to support 6 Telephone Lines (CO Lines) and 16 XBLUE X16 Digital Phones. 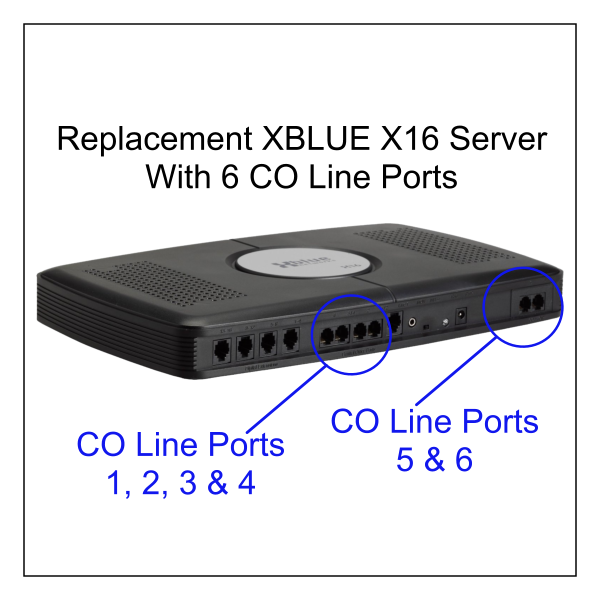 The X16 standard server comes equipped with four (4) Telephone Company Line ports, which are labeled “Central Office”. By adding the 1630-00 2-Port Expansion Telephone Line Expansion Board, the system is now equipped with two additional Telephone Line ports, A total of six (6) Telephone Company Line ports are supported. All X16 servers are equipped support up to 16 digital extension ports.